Compared to the life of famed superspy James Bond, buying or selling Wilsonville, Oregon real estate is dull and monotonous, right? Au contraire. You might be surprised to see how such a comparison actually sizes up. How could the seemingly routine tasks associated with Wilsonville, Oregon real estate possibly compare to the life and adventures of ultra-suave Agent 007? Initially, it seems like a ridiculous question. Of course Bond’s life is far more treacherous, risky and ‘on the edge,’ right? As we’ll soon learn, not exactly. Buyers and sellers of Wilsonville real estate have a lot more in common with the famous spy than first meets the bullseye. Many actors have played Agent 007 in film, yet each brings to the Bond character their own unique imprint on the multi-faceted Bond persona. But while each person playing 007 is unique, in each iteration of the well-known agent we recognize Bond’s uncanny ability to ‘land on his feet’ and ‘avoid being bested,’ while inching (or sometimes speeding) toward his well-defined goal. Let’s examine some of the super spy’s cinematic character traits and how they might relate to your next Wilsonville real estate transaction. Here are some factors that make the so-called ‘average’ Wilsonville, Oregon homeseller or homebuyer more daring than even Agent 007. Savoir-faire can be adapted to Wilsonville real estate, where a wide variety of ‘tough to predict’ situations occur with surprising frequency. For sellers, this could mean having a buyer’s loan fail, possibly due to buyer disqualification like a credit score drop, or job change. Or perhaps your home needs a new roof and there simply isn’t sufficient equity to pay for it. Or there’s rampant dry rot. Or severe mold. You get the idea. A prepared and practical approach to problem solving is what both James Bond and successful Wilsonville, Oregon homebuyers and homesellers bring to the table. Agent 007 is able to adapt and navigate in almost any environment, whether he finds himself in a high-stakes casino in Monaco, a posh ski lodge in the Swiss Alps, or a poor fishing village in Asia, Bond knows what to do. When buying and selling Wilsonville real estate, you can adapt and navigate in different environments, too, including such changing factors as housing inventory (which can indicate if you’re in a buyer’s or seller’s market) and fluctuating interest rates. Just realize that no matter how things appear, some factors and outcomes are not completely determinable and sometimes virtually unknowable. For example, let’s say you’re selling your Wilsonville home and have three offers on the table to consider. In this scenario, let’s suppose all buyers appear well-qualified and each offer is very similar to the others. Which one do you decide to accept? Which will actually close? Which buyer will be reasonable to work with? Which lender will have even-handed underwriting and not require needless delay or costs? Working with your Realtor, you can reduce risk, perhaps by focusing on how much each buyer is willing to pay, their down payment (where a larger down payment makes it easier for them to get a loan) and even the earnest money deposit and time to your closing date. Such an analysis can help boil things down to those that might make the most difference. The key is to limit your downside risk by making the best decision possible under the circumstances and remain alert. For example, if after accepting one offer on your Wilsonville home, the buyers begin loudly complaining about minor issues, have your Realtor stay in touch with other prospective buyers who expressed interest. That way, you keep the door open for a ‘Plan B’ and later, possibly a ‘Plan C’ if initial buyers bail on your home sale. Agent 007 is often described as debonair. How can that term possibly apply to your next Wilsonville real estate transaction? There are varied definitions to the term debonair, but related terms include courtesy, graciousness and having a sophisticated charm. These traits can be powerful and disarming when dealing with the other side on a home sale. An example of courtesy might mean allowing buyers to schedule a tour before closing for measuring room dimensions or determining paint colors. Being gracious could mean as a buyer you allow the home sellers an extra day to move out, particularly if their moving van broke down. Sophisticated charm might mean leaving a box of chocolates or champagne after you sell a home for when your homebuyers finally move in. Having courage when buying or selling Wilsonville property doesn’t mean you don’t feel fear. It does involve pushing that fear aside to rise above whatever obstacle you are facing. Agent 007 pushes himself out of his comfort zone to face serious fears on a daily basis. This gets him used to feeling comfortable with the uncomfortable. As a Wilsonville, Oregon homeseller or homebuyer, once you desensitize yourself to fear, it will become easier to perform courageous acts, like counteroffering that offer you really don’t want to risk losing, or agreeing to substantial repairs in order to pass a home re-inspection and close the deal. In the middle of a real estate transaction, it’s easy to be overwhelmed. To be successful, it helps to have a well defined plan executed with patience. You also should allow sufficient time for your plan to work. For example, if you’re a Wilsonville homeseller who doesn’t receive an offer in the first few days on the market, understand that if you’ve already examined the latest market data and the average market time is measured in months and not days or even weeks, realize your anxiety may be premature. Keep cool. When buying or selling Wilsonville real estate, it doesn’t hurt to have an experienced Realtor as your own ‘Q’ to keep you out of difficult situations. An experienced Wilsonville real estate broker is someone who has been ‘over the road,’ thereby saving you needless expense, time and worry. So rather than having Bond’s sidekick ‘Q’ demonstrating gadgetry and armory (like a blowtorch on Bond’s Aston-Martin convertible), Wilsonville residents can rely on the calm, cool and collected experience of a proven Realtor to more successfully navigate pitfalls sometimes found in Wilsonville real estate. 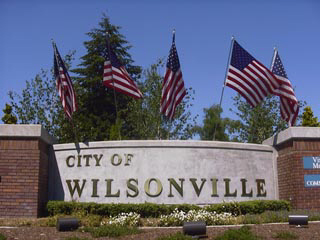 Do You Have Questions About Wilsonville Real Estate? For a free consultation, contact our WilsonvilleHomes.com sponsor, Certified Realty using the contact form below, or call them at 800-637-1950.